To me, the fall is really a time to embrace deep, dark colour palettes and tones you wouldn’t dare try in the summer. While I’m not quite the beauty guru I wished I was, I love playing with make-up as much as the next girl! This year, I’ve been trying out deep burgundy and plum shades of lipstick, muted smoky eyes, and ombré nails. While the photos don't seem to communicate how deep burgundy this lipstick looked in person, I still like the effect. I'm wearing Ultra Violet Moisturizing Lipstick by Elizabeth Arden and my most-loved Diorshow Mascara. This eye shadow palette is new from Clinique! From daytime subtle to dramatic hues, I love the colour options. Titled “A Black Honey Affair,” this palette features 8 shades to play with. Don’t be afraid of colour this season! A plum smoky eye is next on my must-try list! MAC lipsticks are rarely, if ever, a disappointment. This shade in “Dominate” is a slightly metallic, deep purple. For a lipstick so bold, it’s better to keep eyes more subtle. I’d stick to the left end of the previous-mentioned “A Black Honey Affair” eye palette. Holidays mean you can add a little sparkle! This pressed powder in “Golden Opal Pearl” features ultrafine luminescent pearls that reflect and refract light, creating a subtle glow. Perfect for highlighting cheekbones, and it can even be used to create fuller lips with a dab on your lower lip. Mary-Kate and Ashley can do no wrong! This scent set is no exception. Both the white and black scent are distinct, the white being more delicate and feminine, the black more sensual and rich. Depending on your mood, the Elizabeth and James Rollerball Set is well-suited. Personally, I love the airy feel of the white. Part of the Brick Lane Collection, this shade in “Cor Blimey” is a brilliant aubergine, one of my favourite colours to wear this season. I love my growing collection of Butter nail laquers, as I find it relatively chip-resistant and long lasting. While shopping for my fall wardrobe update this season, I discovered Raise. Have you ever received a gift card to a store you know you’ll never shop at? With Raise, you can either sell your gift cards or buy gift cards at a discounted price to some of the best retailers, including some of my favourite retail stores like Topshop, Urban Outfitters, Saks Fifth Avenue. Not limited to clothing, Raise also offers discounted gift cards to food and beverage companies like Starbucks and Whole Foods, yoga studio discount cards, spa certificates, and so much more. Buy discounted gift cards or sell your unwanted gift cards with Raise! Such a great concept. Check them out HERE. What’s on your fall beauty wish list? Plan to try any new trends? Don’t forget, you can get a discounted gift card to MAC Cosmetics or Sephora with Raise HERE! 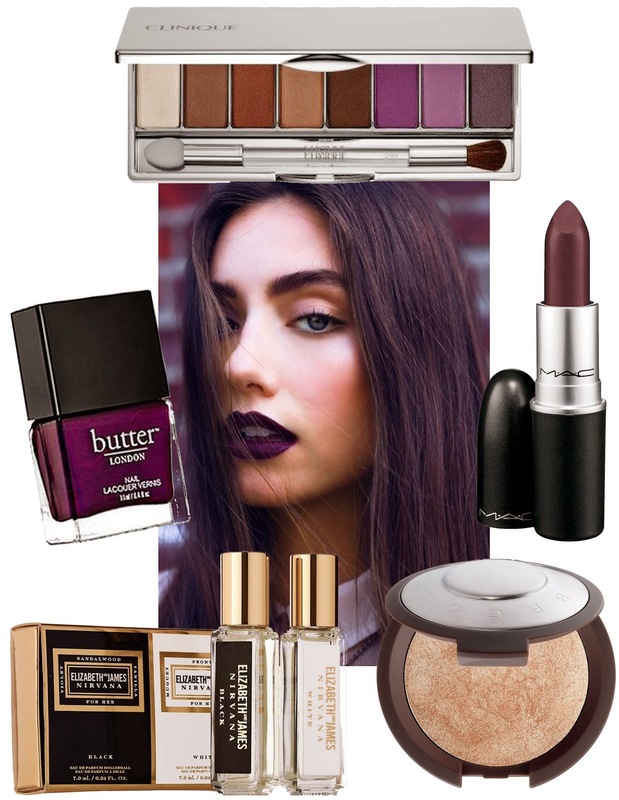 12 comments on "Fall Beauty & Top 5"
I love that lip color, wine is big this fall! I will have to check out that new Clinique palatte, there are bonuses going on so this gives me an excuse to get something! OMG I LOVE your jacket!!!! I would kill for that - such a cool style and color! These colors looks great on you. The outfit I absolutely love. Wow. These are cool looks. I've got to get some MAC. ROAWO x Boho Nouveau Fall GIVEAWAY!